#12 – Where Buzzer, Buzzer, Buzzer Beaters Happen. Kellen Carpenter is an RTC correspondent and ACC microsite writer. 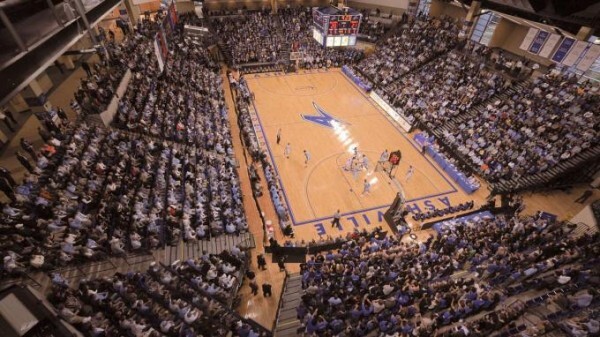 He filed this report from Friday night’s UNC game versus Gardner-Webb. James Michael McAdoo was expected to take a starring role for his North Carolina team and in the first game of this season, a 76-59 victory over Gardner-Webb, he showed what he could do as a star. With a career-high 26 points and 14 rebounds (eight of which were on the offensive glass), McAdoo is clearly on the path to fulfilling his first-team All-ACC expectations. The team as a whole however, is clearly one that is a work in progress. Desmond Hubert earned the fifth Tar Heel starting spot in the post, but he struggled, tallying only four rebounds and failing to score while turning the ball over twice in 13 minutes. He was also memorably bowled over by Mike Byron just a few minutes after tip. Roy Williams made a change by starting Joel James in the second half, and, for his part, James played with a lot of energy but he struggled to stay on the court, accruing four fouls in only 14 minutes of play. The question of the frontcourt rotation is clearly an unsolved riddle for this team, with Williams freely experimenting and looking for a combination that was effective on both ends of the court. Brice Johnson looked polished on offense, but in limited minutes it’s hard to draw too many conclusions about him. Roy Williams said afterward that he isn’t sure who will fill this spot for the next game. The backcourt rotation also presented a puzzle. Freshman point guard Marcus Paige started and managed to tally four turnovers and zero assists in his 28 minutes, not exactly an auspicious start for the team’s chief playmaker. On the perimeter, one of UNC’s supposed best shooting teams in recent memory managed to shoot 1-of-12 from the field while going 9-of-19 from the free throw line. Granted, a lot of the poor shooting from the stripe was due to McAdoo’s 6-of-11. Every March the topic of scheduling rears its ugly head as fans and analysts rip teams for their soft non-conference schedules. Did you ever wonder how teams come up with those schedules? Surely it involves putting together the team statistician, the chairman of mathematics, and the chairman of computer sciences at the university to crunch the numbers to come up with the optimal schedule to allow their school to appease that all-important Selection Committee on Selection Sunday, right? It turns out that it really isn’t that advanced. In some ways, it comes down to a representative of the basketball program putting up a request and basically announcing “call me if you are interested”. As John Ezekowitz noted it is basically “NCAA Basketball’s Craigslist” where teams try to figure out how to fill their schedules and potentially offer monetary incentives in what are commonly known as “guarantee games”. Essentially a guarantee game is one in which a lesser team is paid (often rather handsomely) to travel to a better team’s arena for a game (read Kyle Whelliston’s account of one such game for more details). These games have often been derided as being against the spirit of the game. Obviously the financial incentive for the proverbial “sacrificial lamb” is a little unseemly and viewed by some as unsportsmanlike. Then there is the competitiveness issue as these games often are blowouts. Some coaches, including Lefty Driesell in our interview with him before this season, have expressed unhappiness at the fact that it does not allow for the traditional home-and-home match-ups that could generate a lot of buzz and ticket revenue for the smaller program, but the bigger program does not want to do so because frankly there is nothing in it for them. If they go on the road and win, who cares? They beat a team that means nothing on the national level and they lost the ability to sell themselves in front of a major recruit. And if they lose on the road? The world ends for a few days as boosters and fans call for the coach’s head and the players have their Facebook walls and Twitter accounts bombarded by all sorts of profane messages.